British people do not want a second EU referendum or a delay to Brexit, senior Labour frontbencher Angela Rayner has said. The shadow education secretary said politicians will have “failed the public” if they ask voters to give their views on EU membership again. Corbyn has so far been reluctant to support a second referendum but is facing pressure from some of his own MPs and party members to do so. Appearing on Ridge on Sunday on Sky News, she went on: “I think if we end up with a second referendum then us as politicians have failed the public. We have failed to be able to do our job. “I would see that as a really difficult situation for us all to be in. “I don’t think people want to see a delay to Article 50, I don’t think people want to see us in a second referendum. “They want to see parliamentarians working together to carry out what happened in the result of the referendum to get the best possible deal we can for Britain moving forward and the only way we can do that next week is by Theresa May actually genuinely working across Parliament and looking at her red lines and seeing how she can build that consensus. Her comments will concern campaigners for a so-called People’s Vote who say they need Labour leader Jeremy Corbyn’s backing to make it a reality. 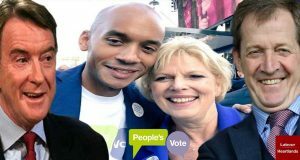 but more concerning to Labour members and supporters are the people running the ‘so-called People’s Vote. People like Peter Mandelson. Maybe the fact this guy is at the head of the table.